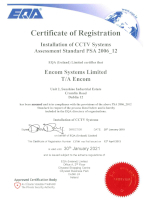 EQA (Ireland) is an independent certification body providing third party verification of Management System, Products and Services in accordance with Irish, European and International standards. Encom have achieved the following quality and industry awards demonstrating to clients that quality is a key objective of the company. The PSA is responsible for licencing and regulating the private security industry in Ireland. It is mandatory for all companies involved in the security industry to be certified by the PSA. Encom’s current certificate is valid until 2019. 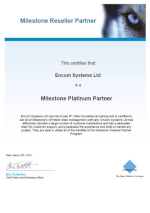 Encom Systems Ltd has had broad IP Video Surveillance training and is certified to sell all of Milestone’s XProtect video management software. Encom Systems Ltd has effectively handled a large number of customer installations and has a dedicated team for customer support, and possesses the experience and skills to handle any project. They are able to utilize all of the benefits of the Milestone Channel Partner Program. Encom qualify for gold status award from Axis, have demonstrated exceptional business performance, support and training. They have system design expertise and staff members who have successfully completed Academy training/certification requirements. They have proven their loyalty and ability to design and integrate Axis products in the most challenging enterprise customer solutions. Intel, the world leader in silicon innovation, develops technologies, products, and initiatives to continually advance how people work and live. 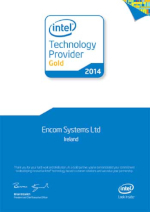 Encom have a long established relationship with intel and that is recognised by the Intel Gold Partner Award. SALTO Systems has grown to be the market leader in state-of-the-art electronic access control systems with a wide range of innovative products controling security access for a growing range of end users from Airports to Hospitals, Banks to Government Buildings and Universities to Hotels. 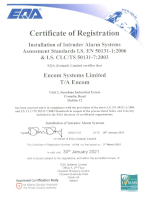 Encom are trained to install and manage Siemens Intruder Detection Systems. Siemens is a global powerhouse focusing on the areas of electrification, automation and digitalization and is one of the world’s largest producers of energy-efficient, resource-saving technologies. Siemens Intruder Detection Systems are installed in a variety of configurations, ranging from individual systems to complex security networks.